The discovery of diamonds in 1908 by August Stauch started a diamond rush, drawing prospectors and adventurers from all over the world. New diamond fields were discovered and opened up daily and the newly found riches were feverishly exploited. At the height of diamond fever between 1908 and 1910, the number of whites (mainly Europeans) in Lüderitz more than doubled from 839 to 1,757. It is not surprising, therefore, that the presence of the nouveau riche was reflected in the architecture of Lüderitz. A number of luxurious villas sprung up, mostly double storeyed, which became known as diamond palaces. One of these was the so-called Goerke House, the villa of the mine inspector for a German diamond-mining company. The inspector, Hans Goerke, had the house built in 1909 and took up residence in 1910. Although the building was erected in the art nouveau period (1890-1910), its architecture is not typical of this style. Nonetheless, the interior features a number of art nouveau ornaments, like the flamingos on the coloured window panes, the ornamentation on the wardrobe in the entrance hall, and the attempt to develop a new style by mixing existing styles. The house consists of two storeys, a tower room and a small cellar. Its ceiling is decorated with impressionistic paintings. A wooden loggia separates the anteroom from the room from which all the other rooms are accessible. Apart from the hall and the arch, the spacious hall of a staircase joins the two storeys. The arches are supported by a pillar with a Dorian capital and swollen shaft, reminiscent of Egyptian pillars. The posts of the staircases are individual compositions and refer only distantly to historical examples. The coloured glass of the staircase shows a flamingo scene with the flowing lines typical of for art nouveau, popular in German architecture at the time. All the rooms were fitted with electrical light. The candlesticks are fanciful compositions with elements of classicism art nouveau, quite different from the modern functional lamps that could be found on the markets in Germany at the time. The outside of the building shows stronger historicist features. The rocks of the foundation reach up into the outer walls. Every room protrudes outwards, and this feature renders remarkable habitable advantages. For example, the sitting room is extended by a console, the dining room by an alcove, and the bedrooms have balconies or alcoves. The sundial, and the gargoyle at the balcony of the main bedroom are Wilhelmian decorations hitherto unknown in German South West Africa. Critics consider this building as “the best preserved and richest house of the period with remarkable interiors”. This probably refers to the buildings of Lüderitz only, but might as well apply to all similar buildings from the German colonial period elsewhere in the country. The Magistrate’s Residence in Lüderitz is rated as an A Class building and scored 94 on NIA Index, and was proclaimed as a national monument on 26 September 1975. 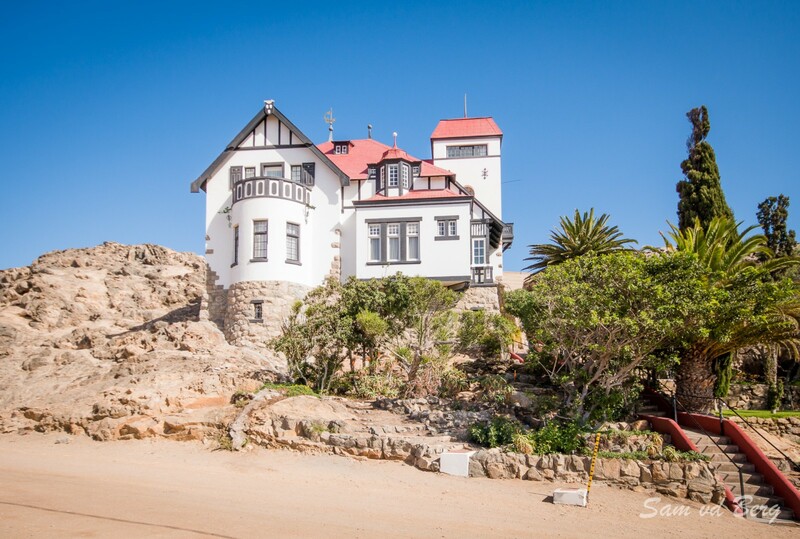 The Magistrate’s Residence (Goerke House) in Luderitz belongs to the Namdeb Diamond Corporation. It can be viewed in Am Diamandberg street. Visiting hours: 14:00 till 16:00 (Mo-Fr) and 16:00 till 17:00 (Sa-Su). Text supplied by Willem Kotzé.